The true urban high-rise living with convenience, luxury and comfort in ICON. This bright and modern condo is on the 18th floor with view of Petco Park and San Diego Bay. Well designed 1 bedroom, 1 full bath condo unit is designed for modern living, features New waterproof wood looking vinyl floor, granite counter top, fresh paint, stainless appliances, and washer & dryer. Unit has 1 assigned on-site parking space in the building garage. ICON is an oasis from the busy work life with 24hr front desk attendThe true urban high-rise living with convenience, luxury and comfort in ICON. 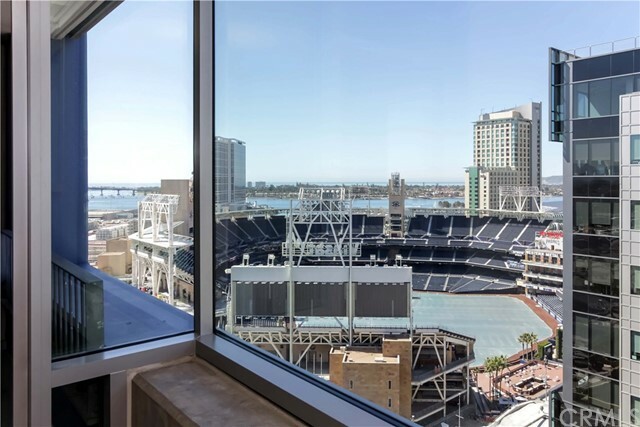 This bright and modern condo is on the 18th floor with view of Petco Park and San Diego Bay. Well designed 1 bedroom, 1 full bath condo unit is designed for modern living, features New waterproof wood looking vinyl floor, granite counter top, fresh paint, stainless appliances, and washer & dryer. Unit has 1 assigned on-site parking space in the building garage. ICON is an oasis from the busy work life with 24hr front desk attendant, amazing 26th floor skybox, fitness room, private movie theater, 5th inning community lounge and much more. Check 3D virtual tour for more detail.